We tailor our wedding reception table plans to your personal requirements. 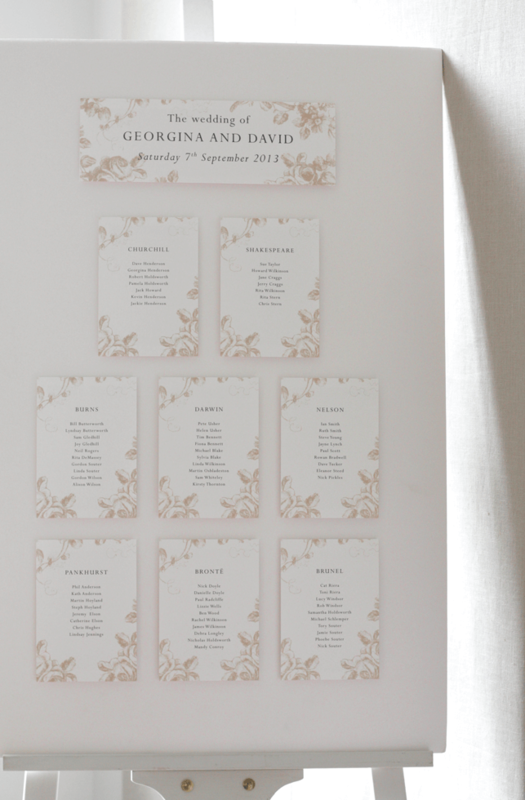 You place the table plan, or seating plan as it is also known, at the entrance to your reception room. It is to show your guests where they are to be seated for the Wedding Breakfast. It will most certainly help things run smoothly! Below are a selection of our seating plans, we do plans to match all of our collections. There are several options available. The hand finished table plans come in the standard size 50 x 70cm or the slightly larger A1. You are able to have these with or without the ribbon details. We also do a flat printed seating plan. This can be sent to you unmounted (which is perfect if you are having a destination wedding) or mounted onto foam board ready for you to display. The frame on the photographs below is to show that the plans are a suitable size to be framed. As the cost of postage is too high, we are not able to supply the frames. However, we will happily give you the details of our supplier. As an alternative, we also provide table lists on separate cards. Clients have attached them to mirrors, hung them on ribbon from tree branches, it seems the ideas are endless!